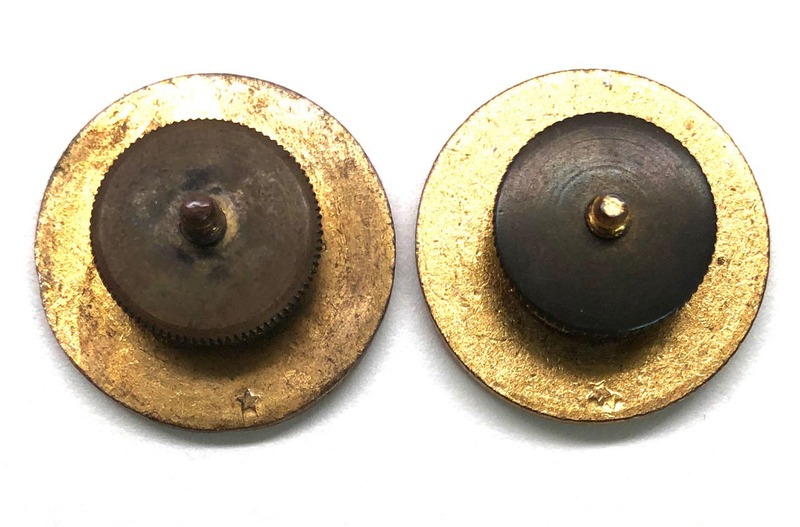 PHYSICAL DESCRIPTION: These two collar discs are in great condition. 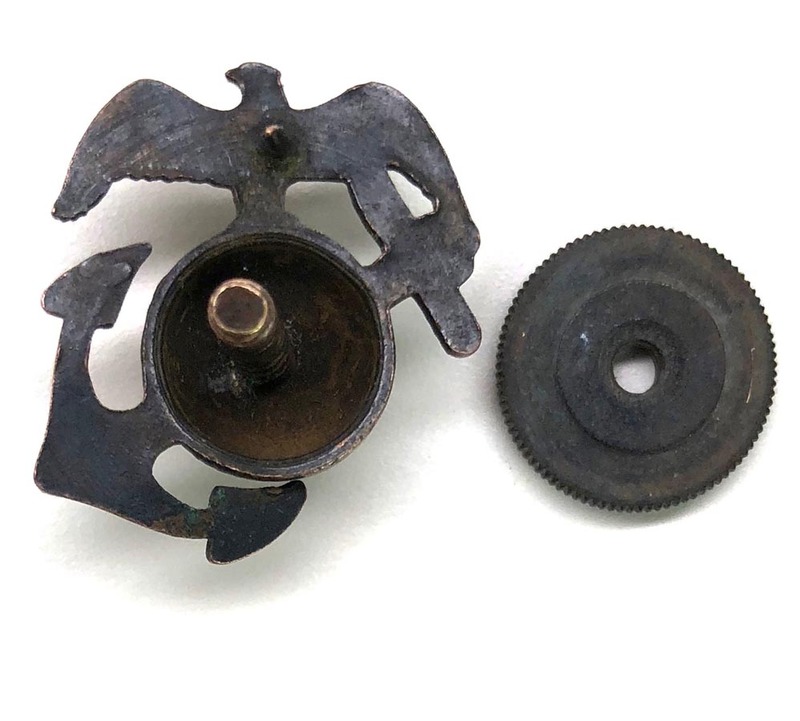 Both screw back devices are present. 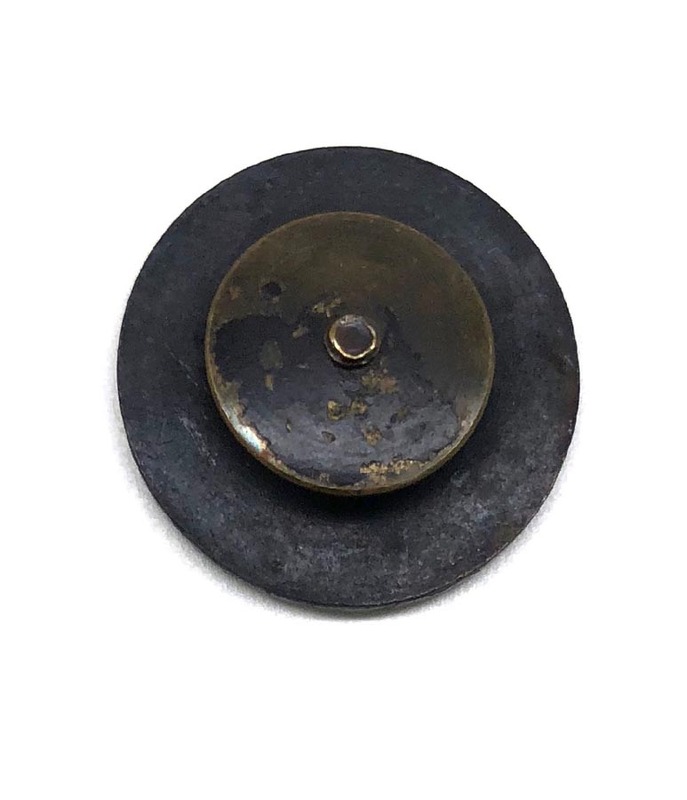 PHYSICAL DESCRIPTION: This US French made Ordnance Collar Disc is in nice condition showing some wear. 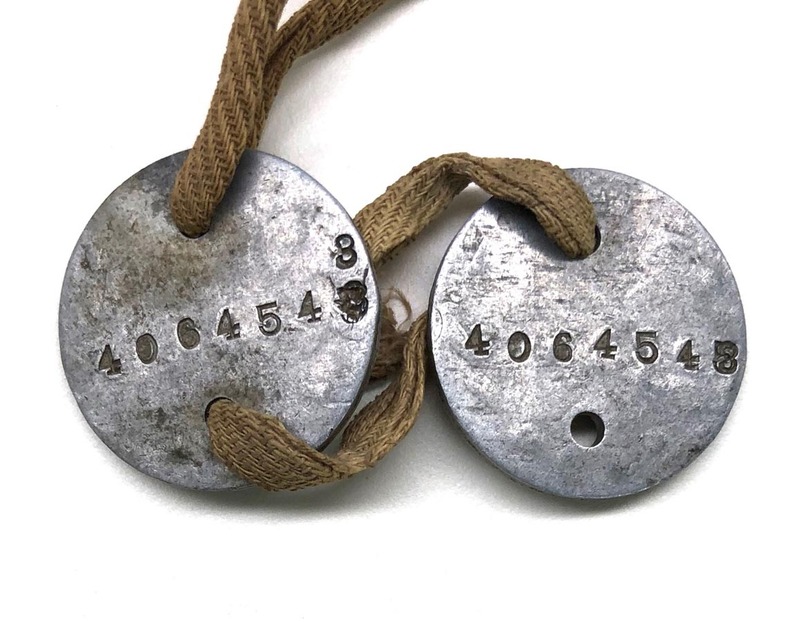 Pin and catch are present to reverse. 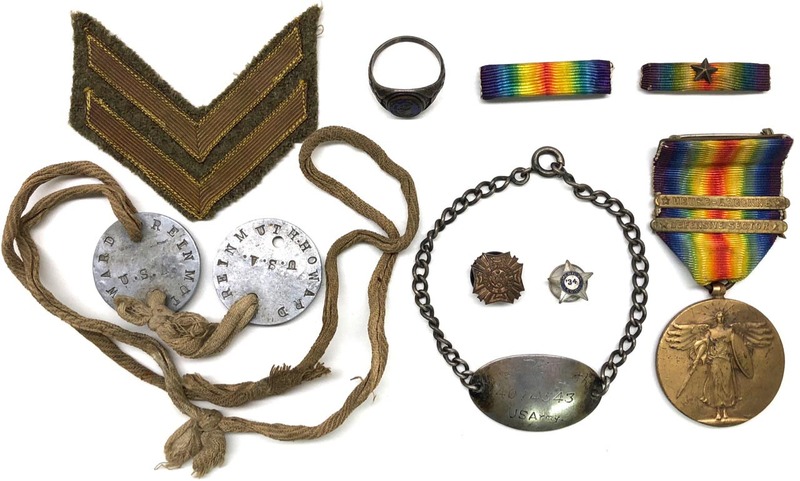 PHYSICAL DESCRIPTION: These matched WW1 Officers collar insignia are in nice condition. 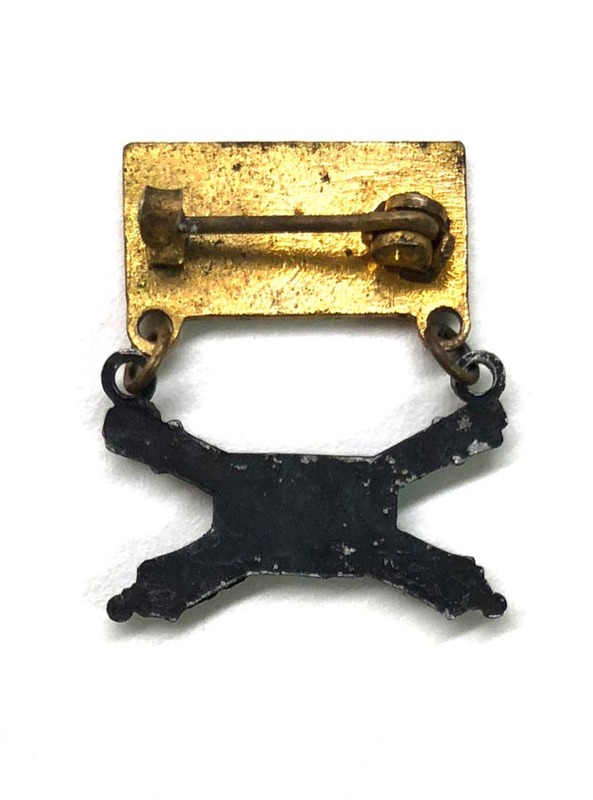 Both fastening pins and catches are present to reverse. 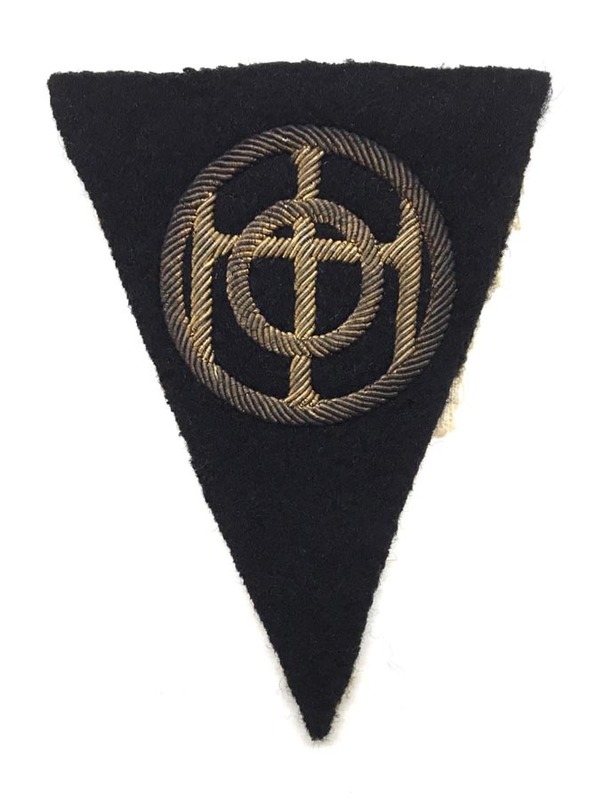 PHYSICAL DESCRIPTION: This WW1 US Army 83rd Division bullion Patch is in great unused condition. Bullion shows some tarnishing. 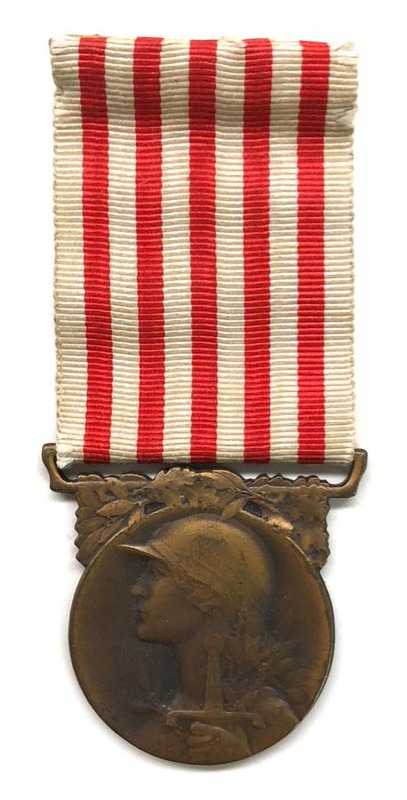 PHYSICAL DESCRIPTION: This France War Service Medal is in nice condition showing some light age. 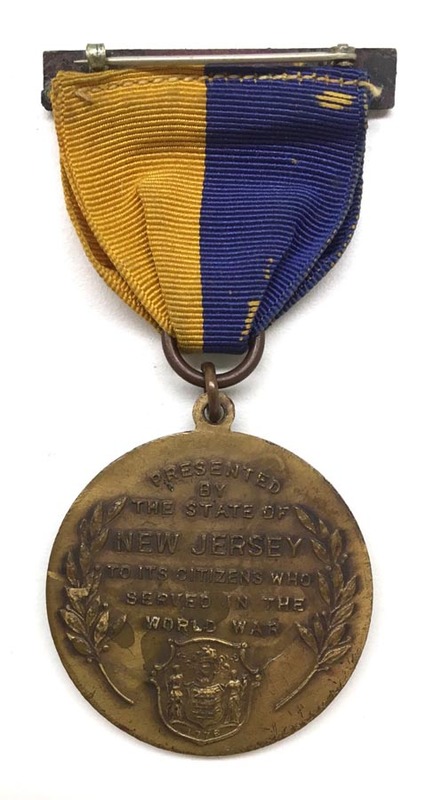 PHYSICAL DESCRIPTION: This WW1 New Jersey State Victory Medal is in real nice condition. 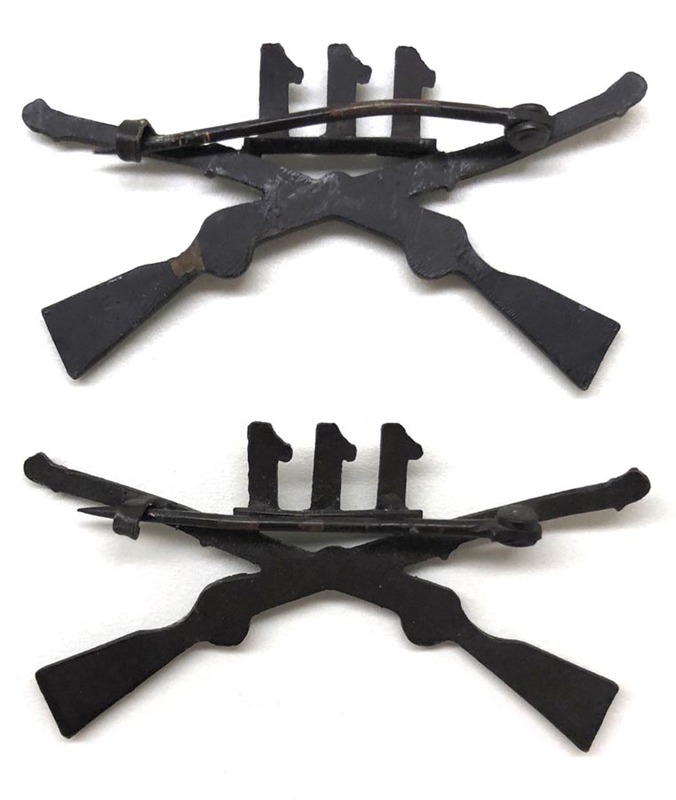 Fastening pin and catch are present to reverse. 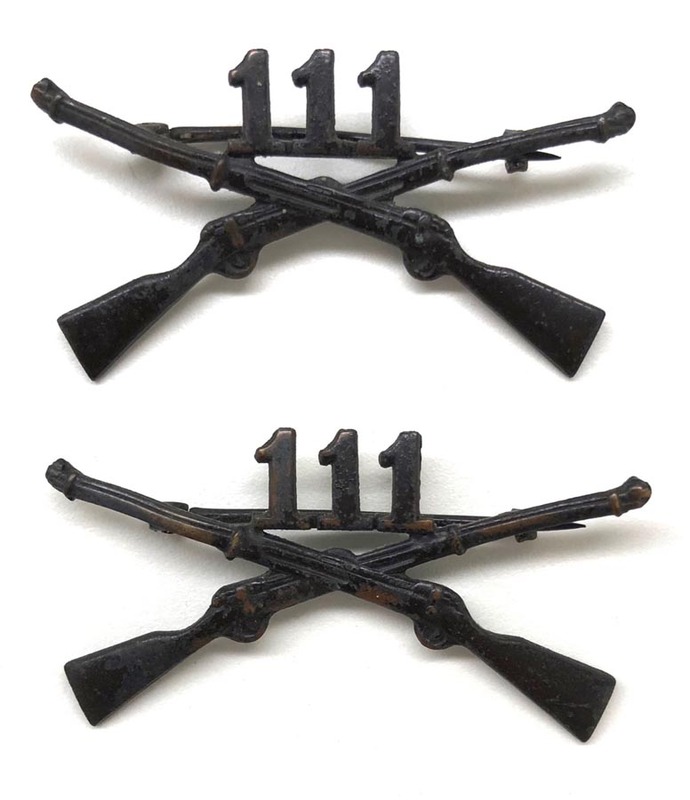 PHYSICAL DESCRIPTION: This WW1 U.S. 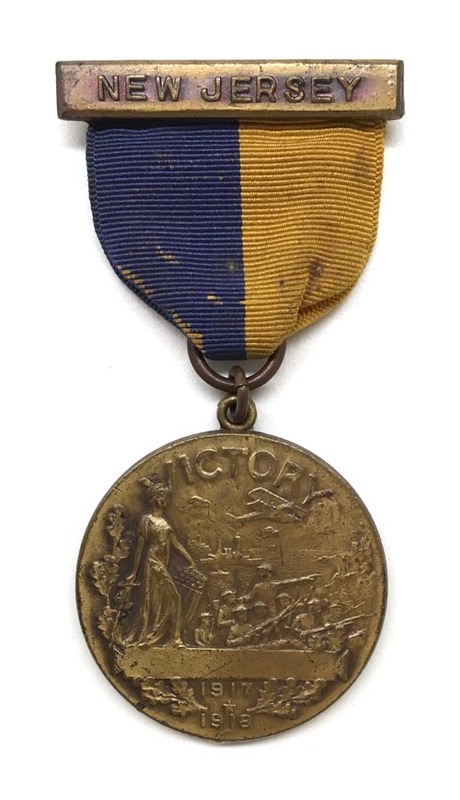 Victory Medal is in nice condition showing some wear and age. Ribbon is soiled but solid. Roller clasp functions nicely. 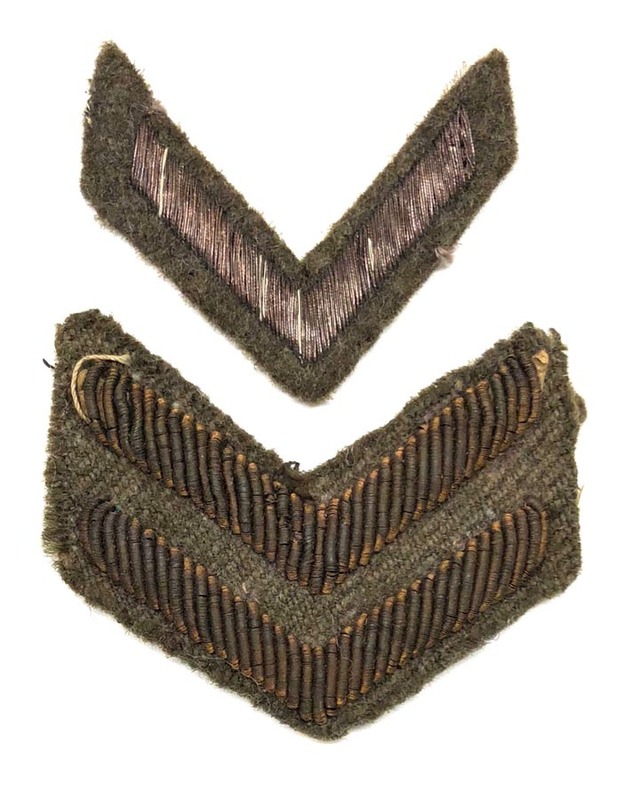 PHYSICAL DESCRIPTION: These WW1 US Army Chevrons are in nice condition showing some light wear and age. 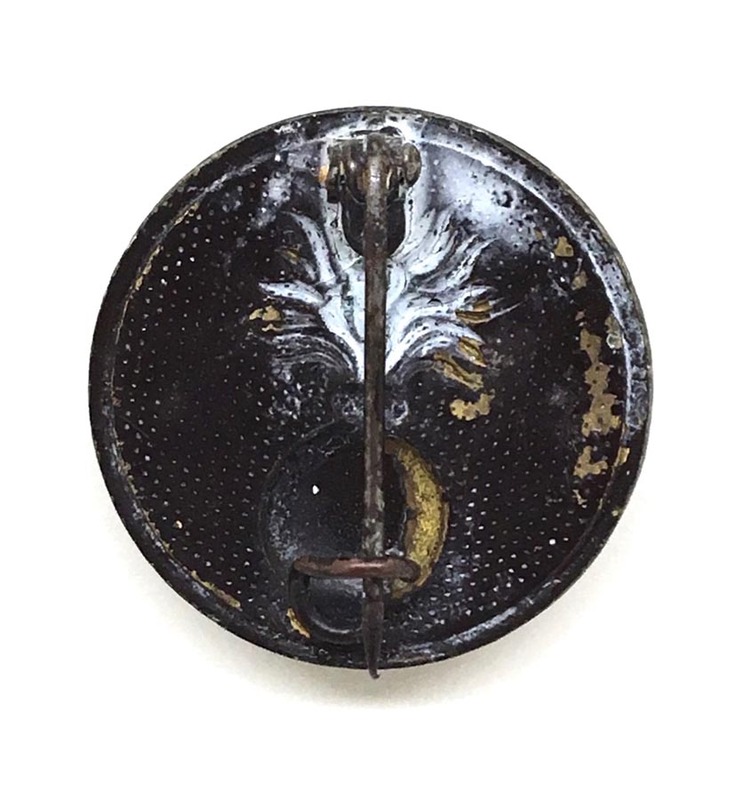 PHYSICAL DESCRIPTION: This WW1 US Army Infantry Collar Disc is in real nice condition maintaining most of it's original black paint. 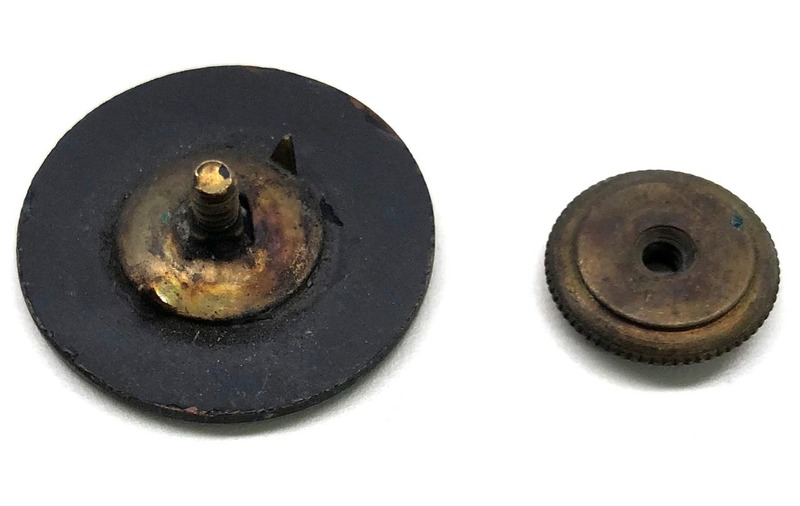 Fastening nut is present. 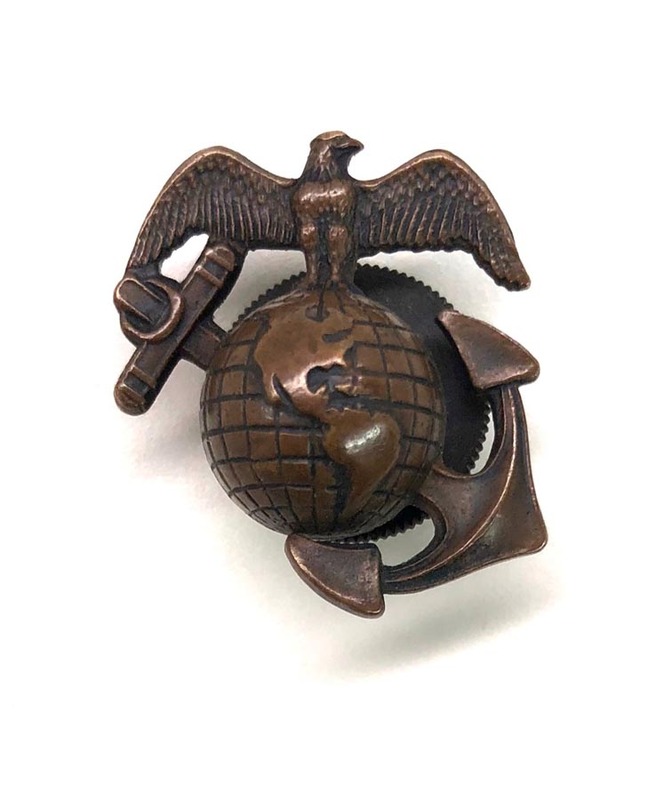 PHYSICAL DESCRIPTION: This WW1 Marine Son in service pin is in real nice condition. There is no enamel damage. Fastening pin is present and functions great. 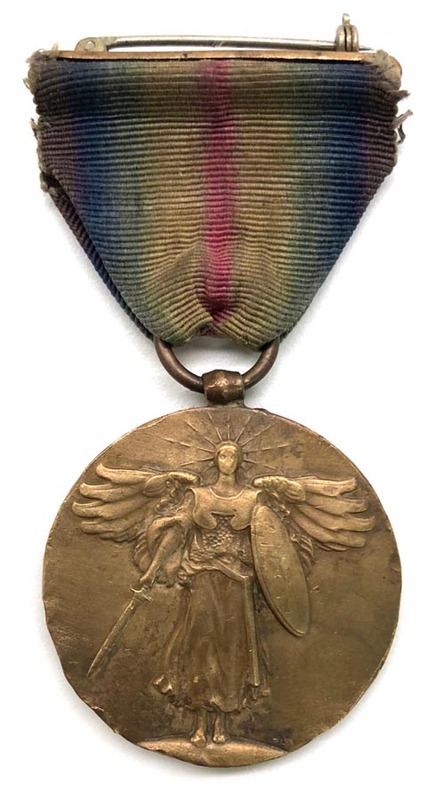 PHYSICAL DESCRIPTION: This WW1 French 1914-1918 Commemorative Medal is in real nice condition. Fastening pin is present and functions great. 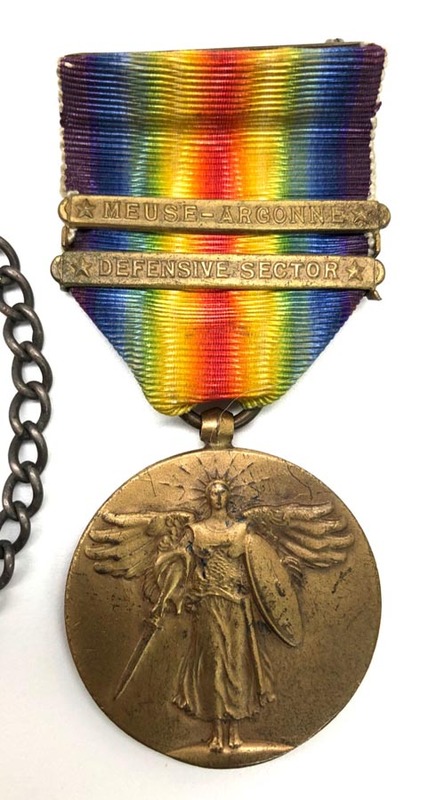 PHYSICAL DESCRIPTION: This WW1 French Croix De Guerre Medal is in real nice condition. 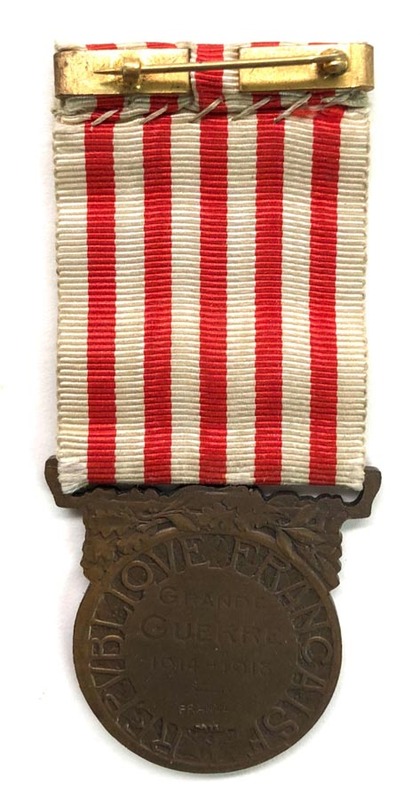 Ribbon shows some light soiling. 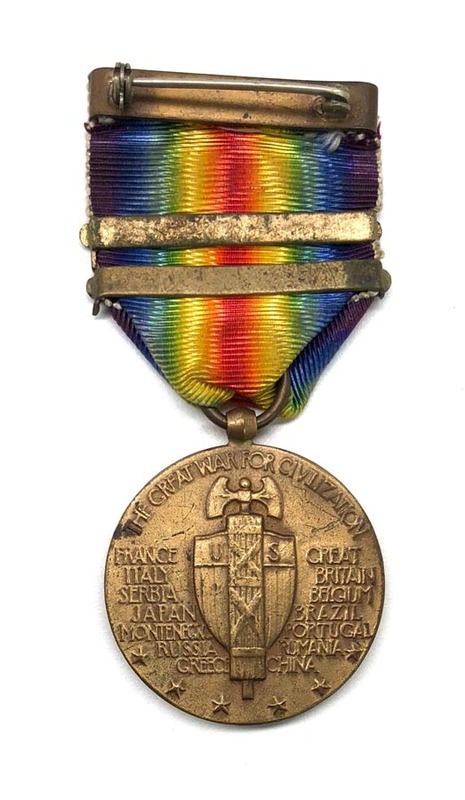 PHYSICAL DESCRIPTION: This WW1 Belgium 1914-1918 Service Medal is in real nice condition with no issues. 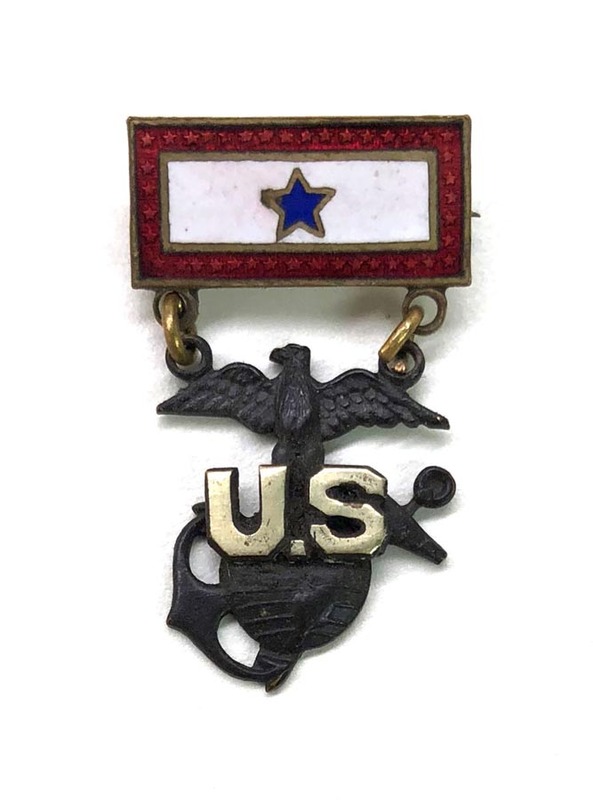 PHYSICAL DESCRIPTION: This USMC China Marine 1926 Pattern Droop Wing EGA is in nice condition. 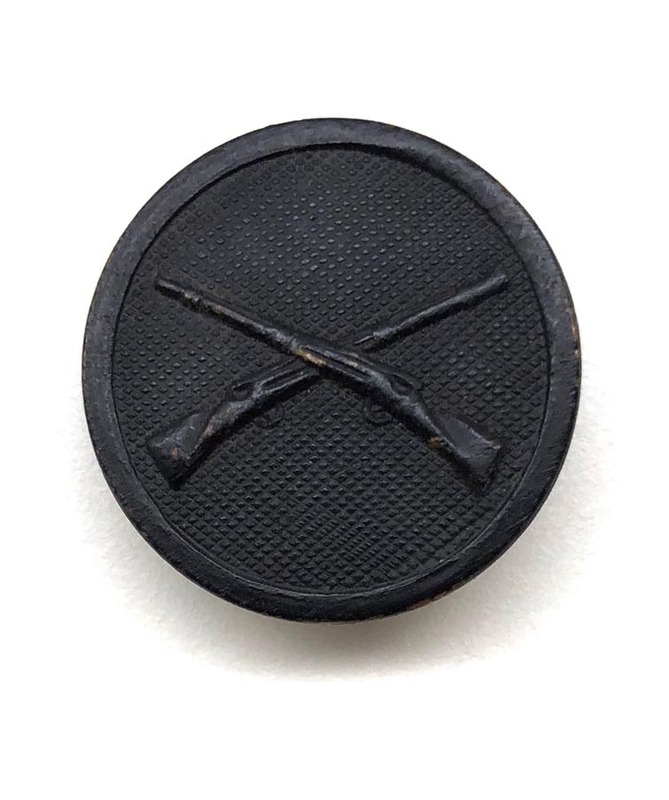 EGA measures 1 inch across. Scarce. 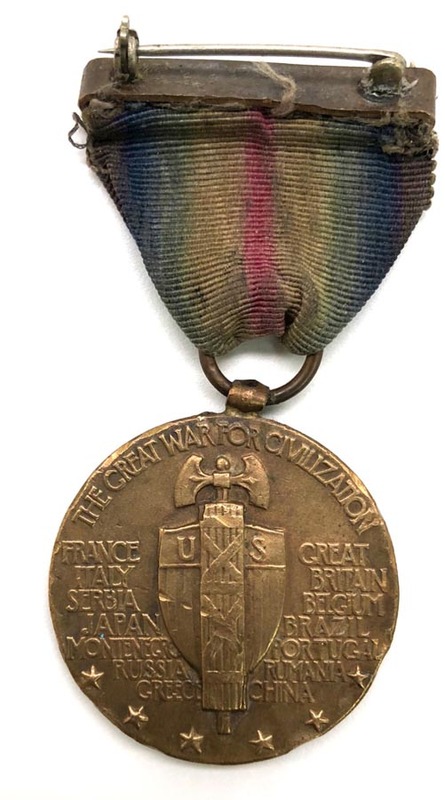 PHYSICAL DESCRIPTION: This WW1 Italy Victory Medal is in real nice condition. 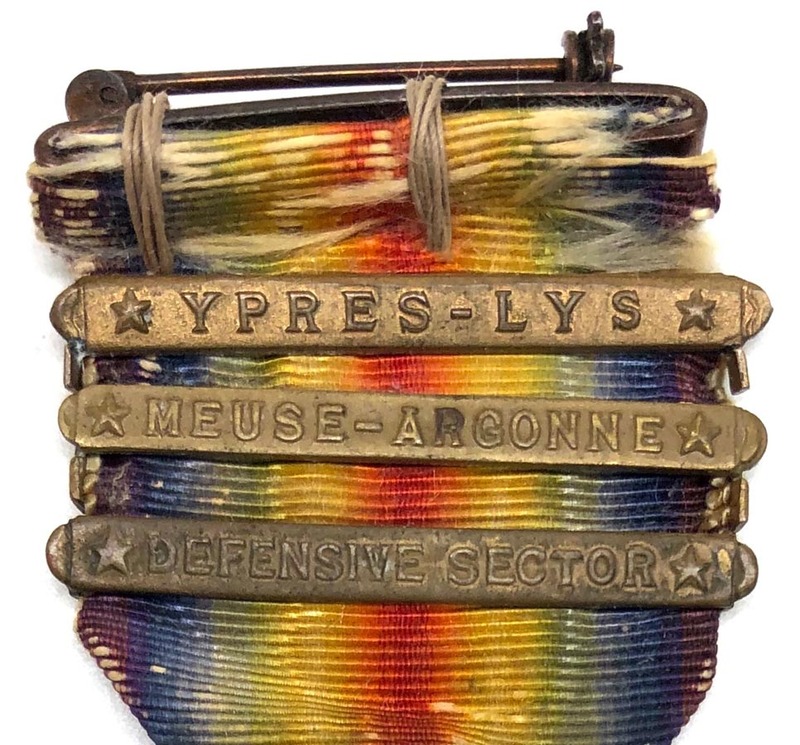 PHYSICAL DESCRIPTION: This WW1 US Army Named Medal Grouping is in nice condition showing some age. 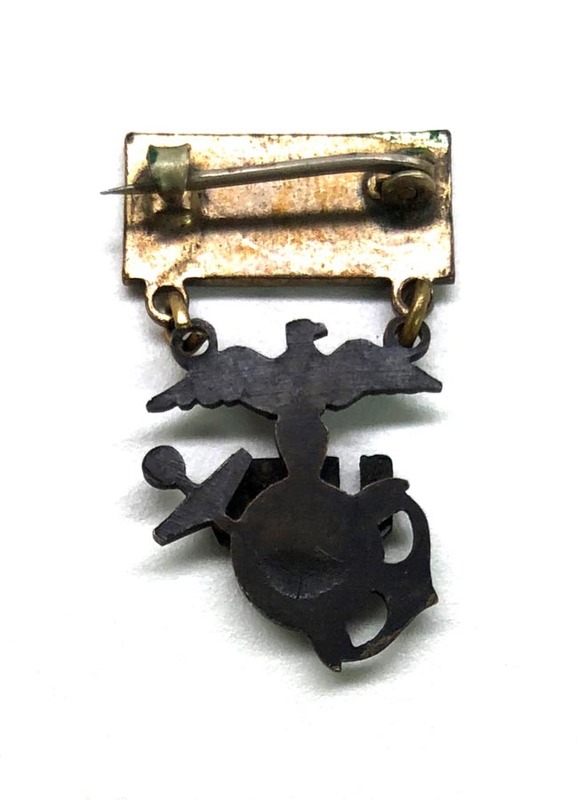 Victory medal has it's fastening pin and it functions great. 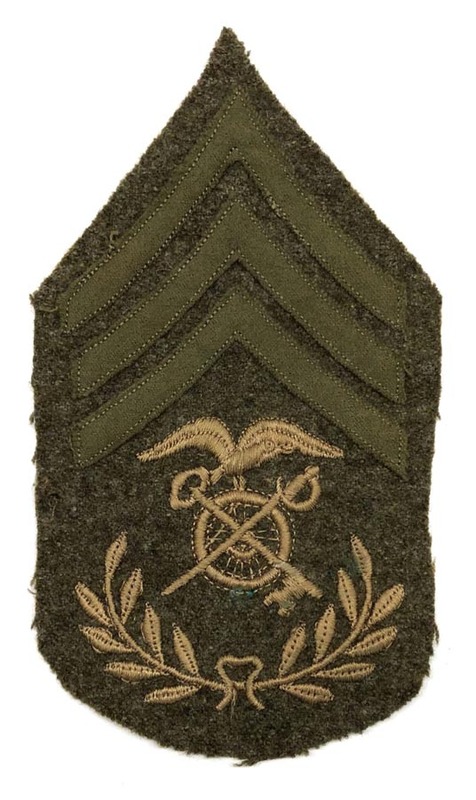 I believe the A.E.F. 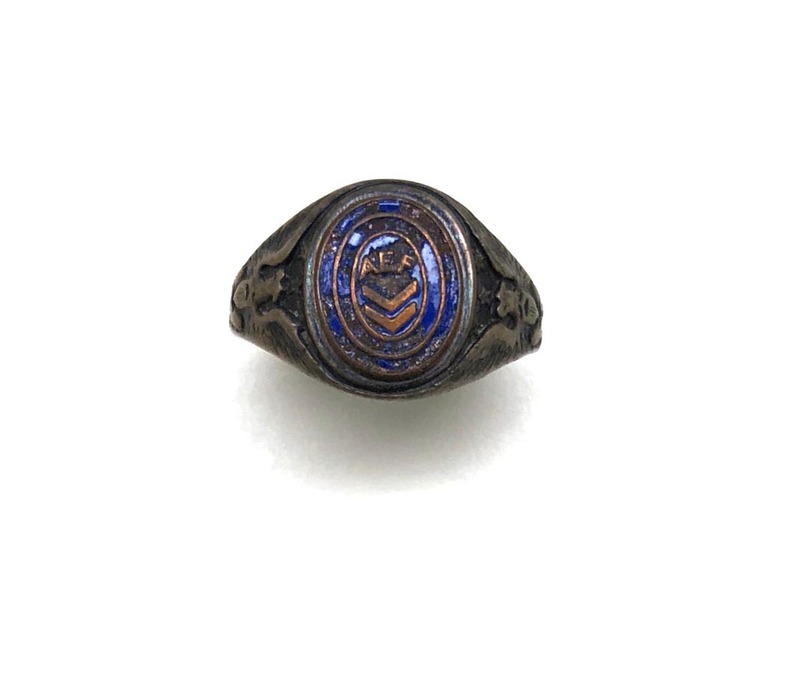 ring is sterling and it does show some enamel damage. 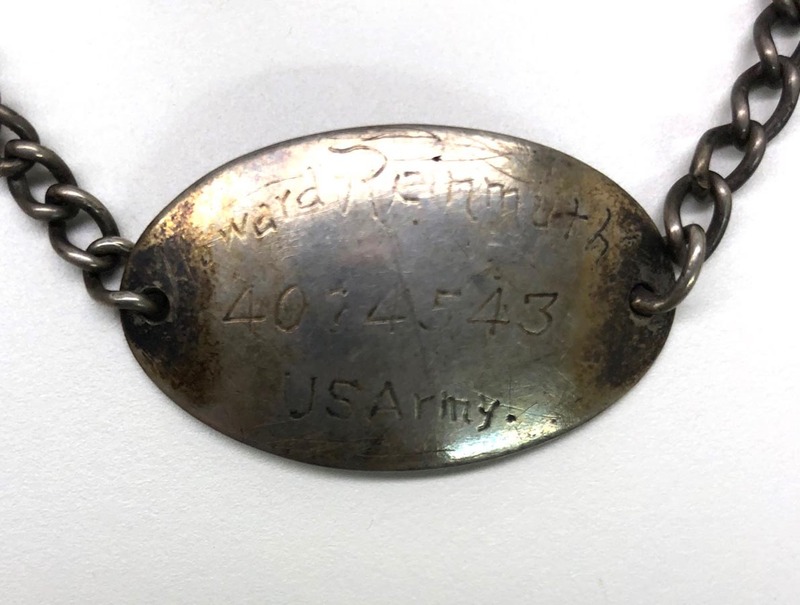 ID bracelet also appears to be sterling. 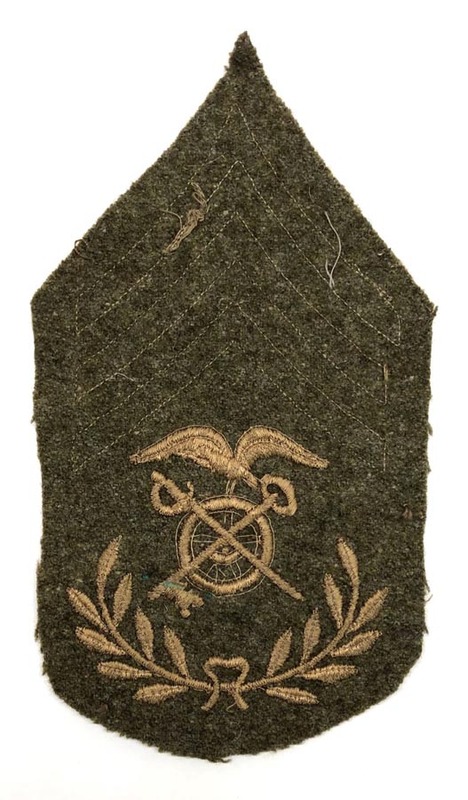 There are two maker marked Victory Medal ribbon bars. 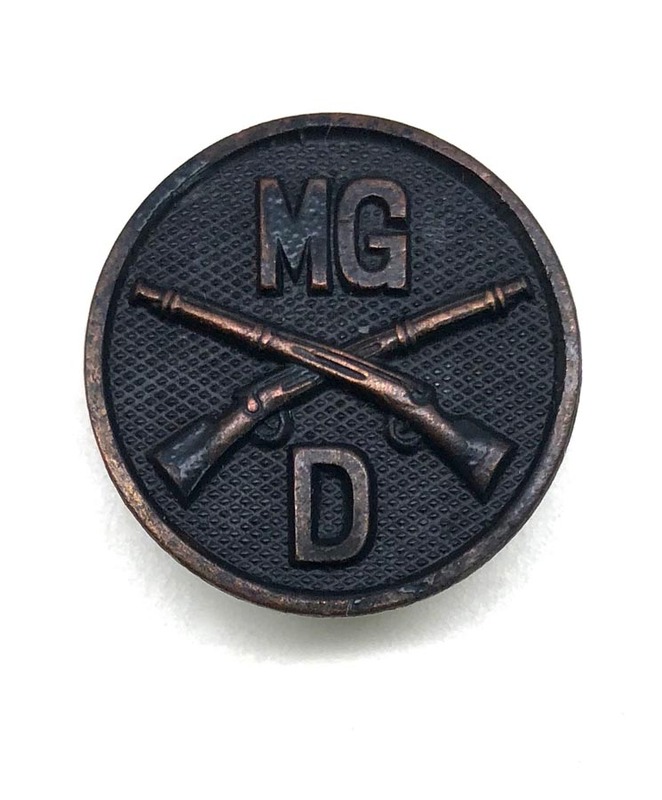 PHYSICAL DESCRIPTION: This WW1 Machine Gun Co D Collar Disc is in real nice condition. Screw back nut is present and functions great. 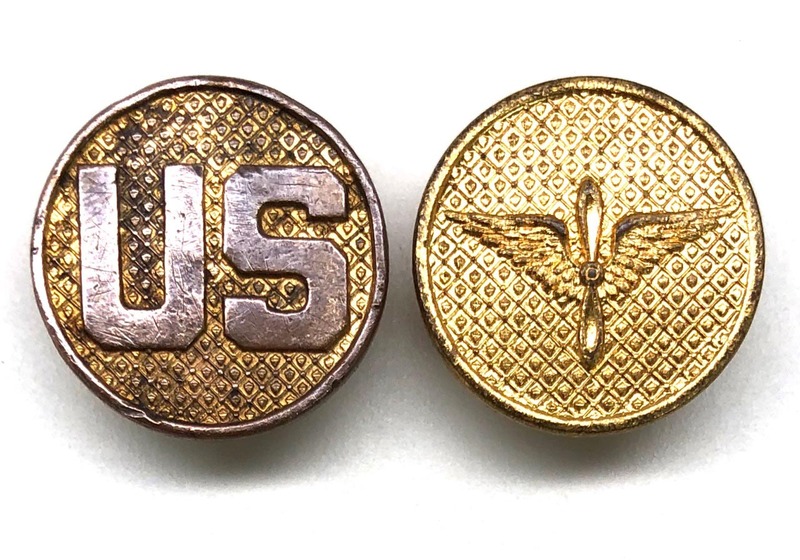 PHYSICAL DESCRIPTION: This 1920's US Army EM/NCO Visor Cap insignia is in real nice condition. 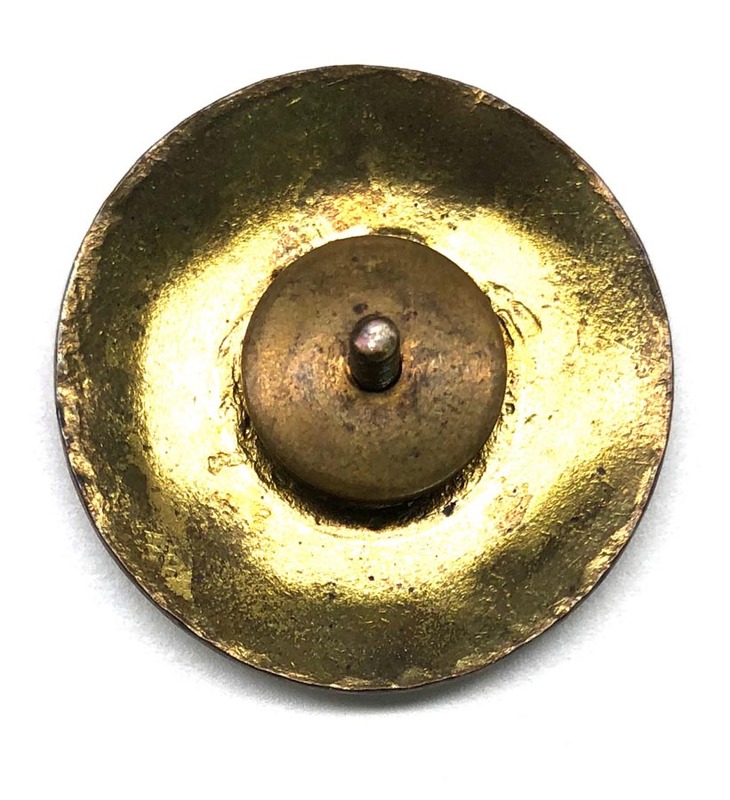 Insignia has it's original fastening nut. 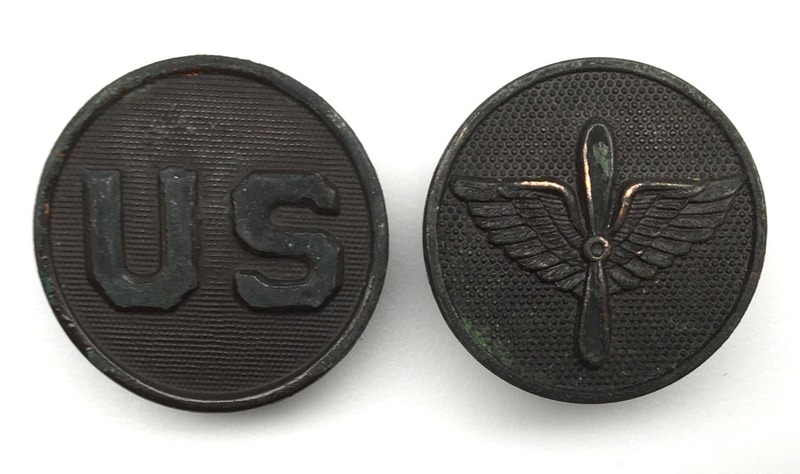 PHYSICAL DESCRIPTION: These 1920's US Army Air Corps & U.S. Collar Discs are in nice condition. 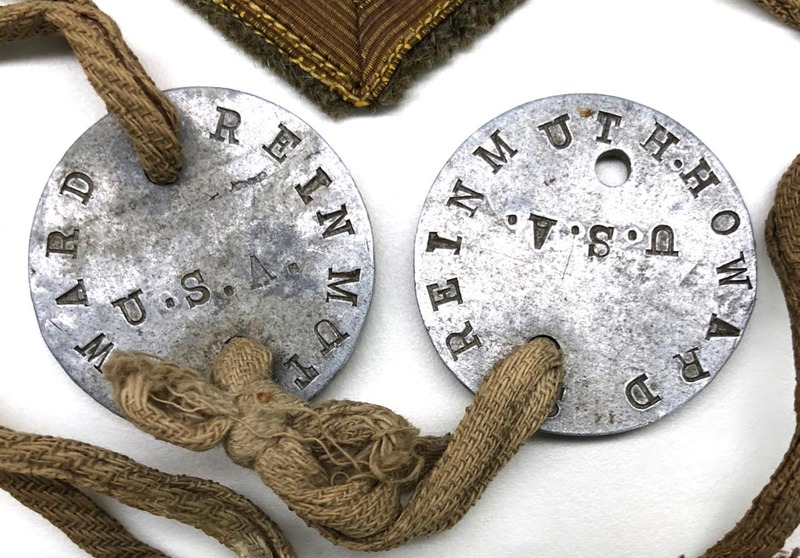 The U.S. collar discs shows some wear and tarnishing. The Air Corps disc is real nice showing hardly no age or wear. 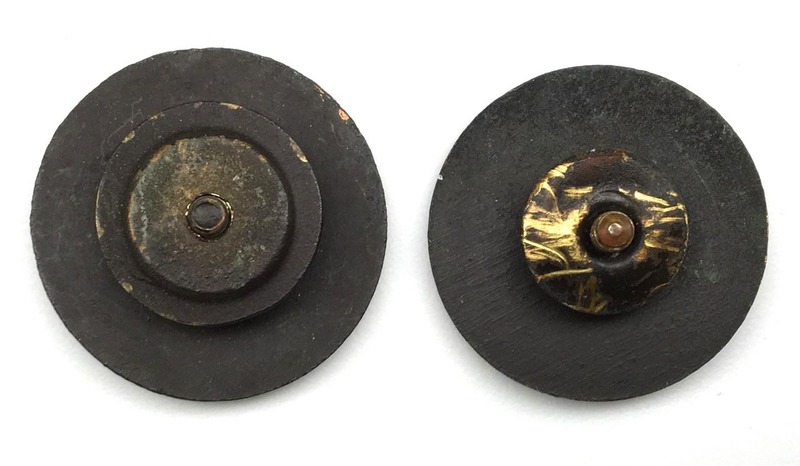 Both discs have their fastening nuts. 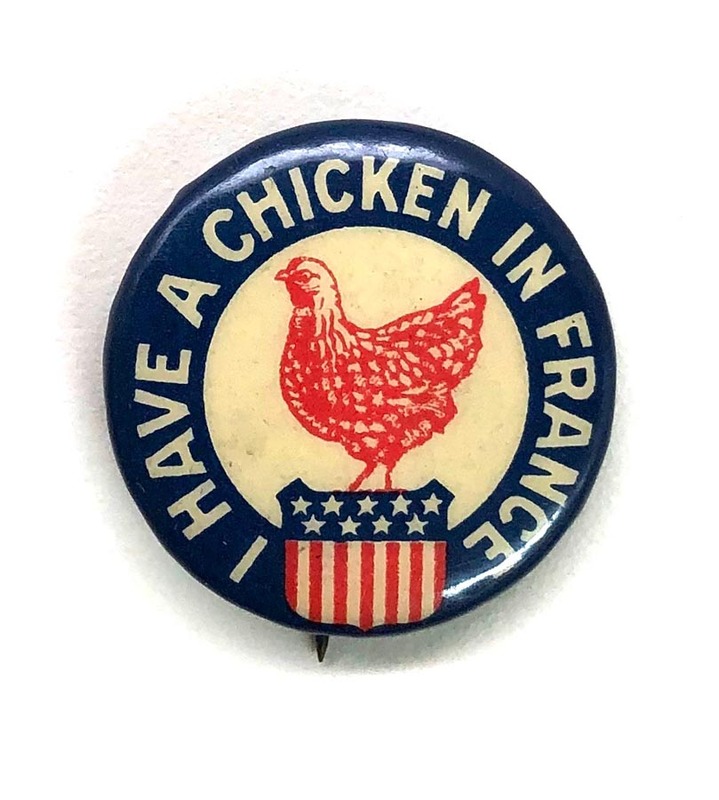 PHYSICAL DESCRIPTION: This WW1 US "I Have a Chicken in France" Finback Button is in real nice condition with no damage. 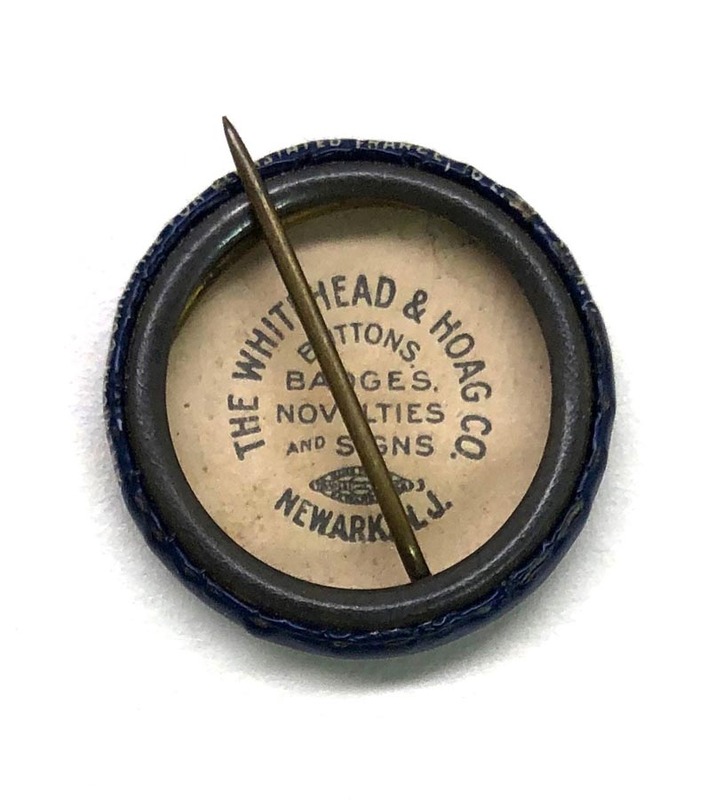 Button is maker marked to back "The Whitehead & Hoag Co.". 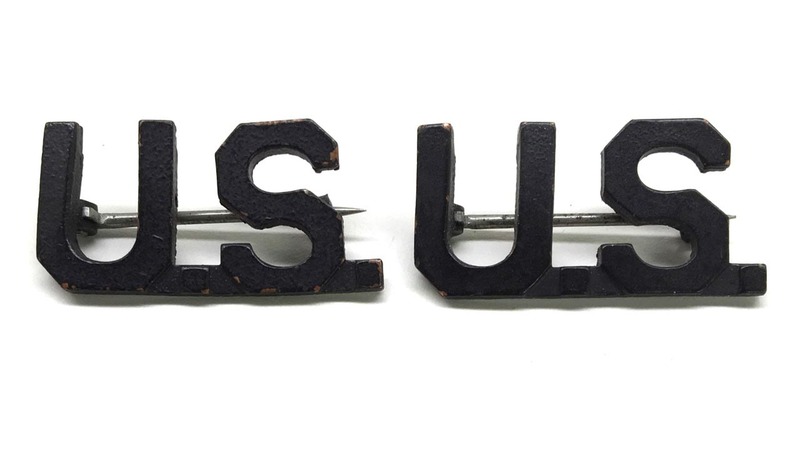 Complete with fastening pin. 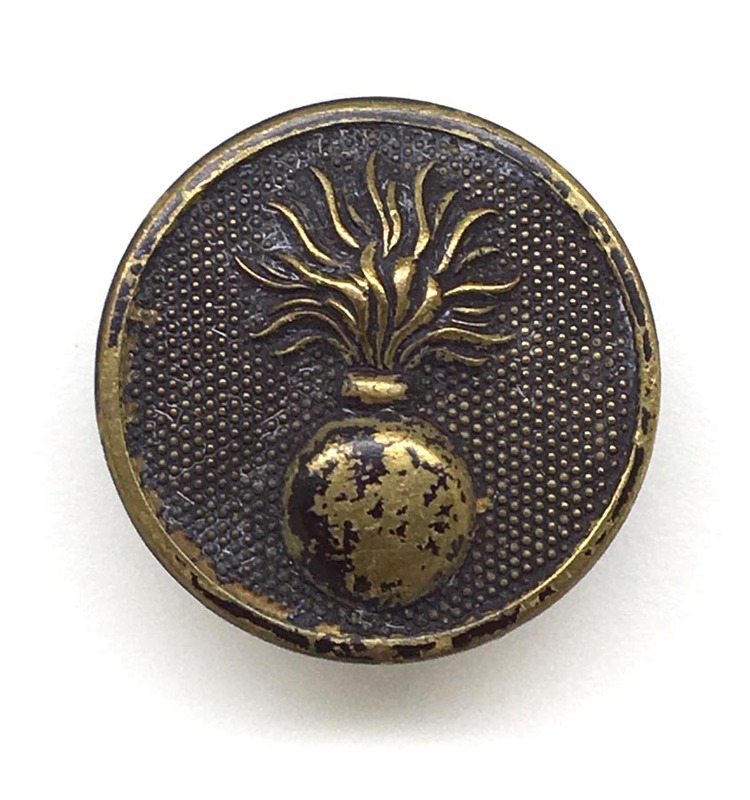 Button measures approximately 7/8 inch across. 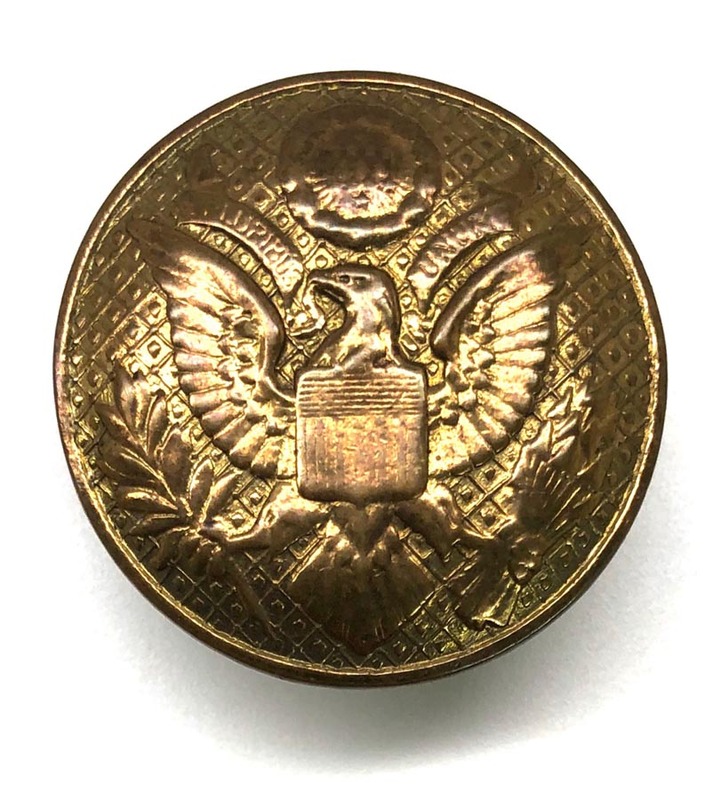 Rim to button reads , "American Committee for Devastated France, 16 E. 39th St. N.Y." . 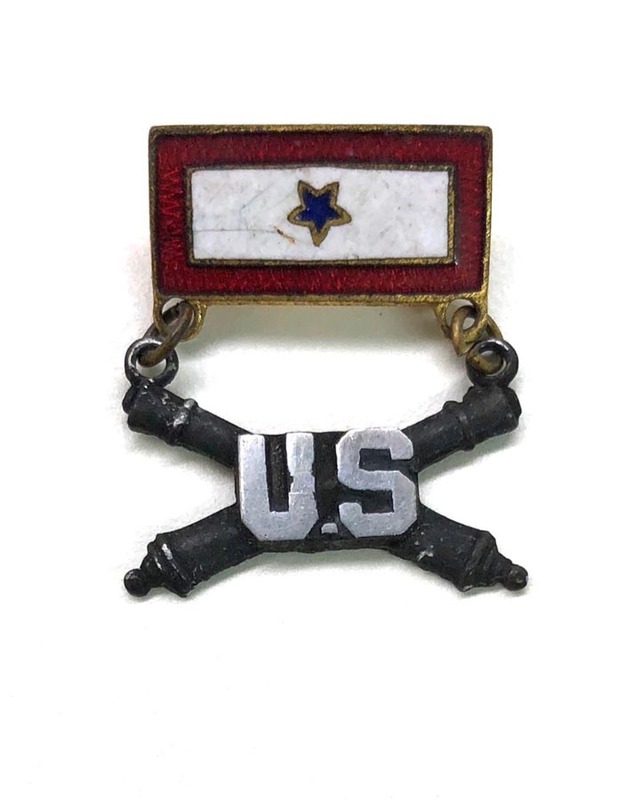 PHYSICAL DESCRIPTION: This WW1 US Victory Medal with 3 Battle Bars is in fair condition showing some wear and age. 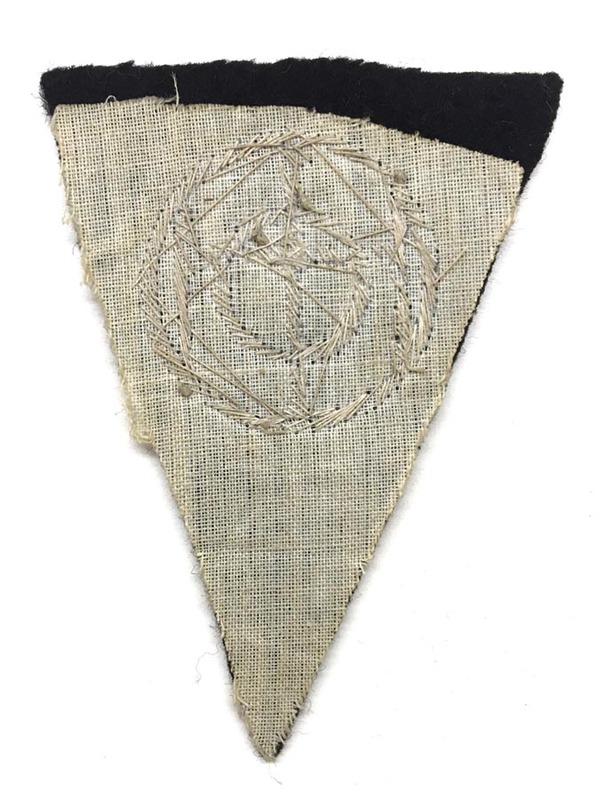 Fastening pin has torn loose from ribbon and has been reapplied with a couple of stitches. 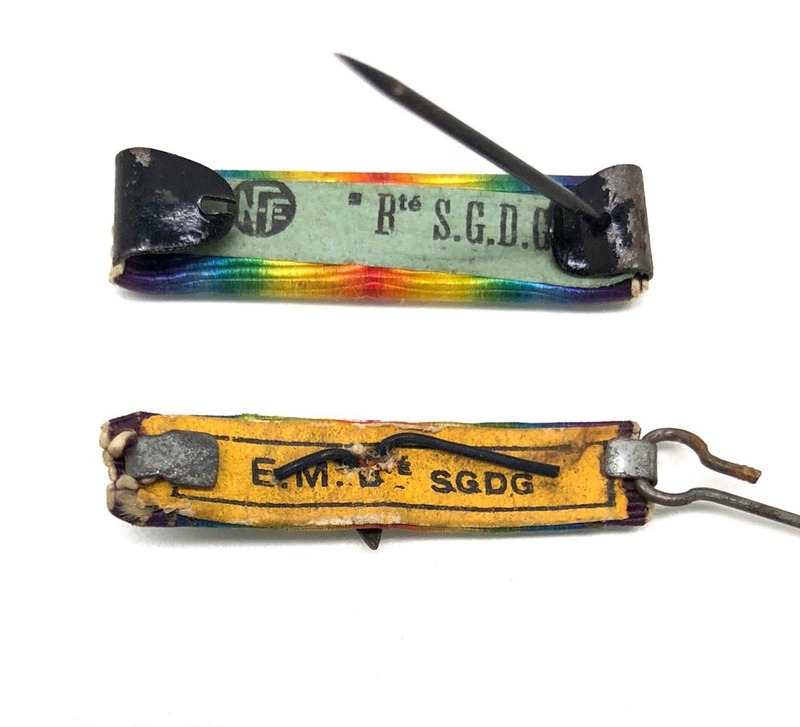 Fastening pin functions great. 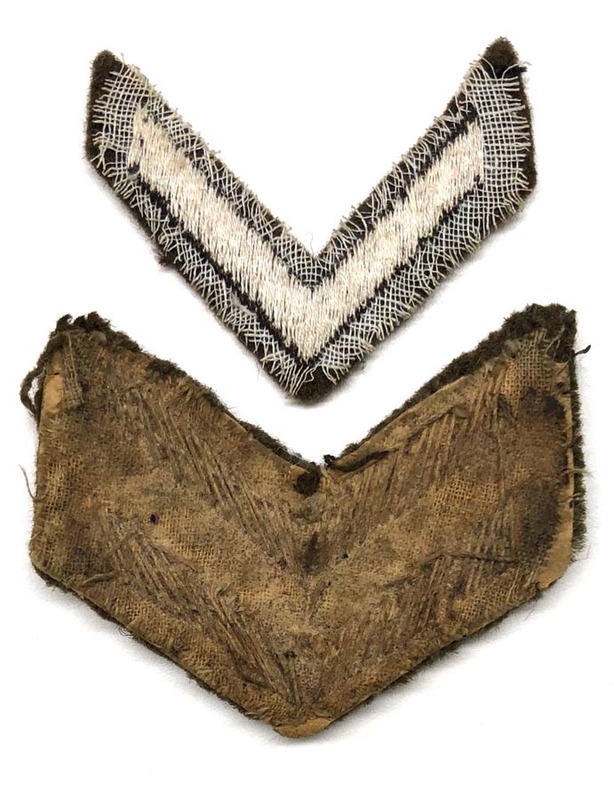 PHYSICAL DESCRIPTION: This WW1 US Army Quartermaster Sergeant Chevron is in real nice condition showing some evidence of once being sewn to a uniform. Chevron has no mothing or damage.